1. WHAT IS JEWISH STUDIES AT PENN? The Jewish Studies Program at Penn provides students the opportunity to explore Jewish culture, history, language, and literature from the era of the Bible through the contemporary period. The major aims to introduce students to the broad chronological and disciplinary scope of Jewish Studies and to familiarize them with the diverse expressions of Jewish culture in different times and places. Those who complete the major will have a firm grasp of the role of Jewish culture within world civilization. Majoring in Jewish Studies is an organic part of a liberal arts education. Students study Jewish culture in dialogue with other disciplines in the humanities. The Program provides opportunities for interaction with faculty members who specialize in a wide range of fields and offers students the chance to pursue individual research, both inside and outside the classroom. 2. WHAT CAN I DO WITH A JEWISH STUDIES MAJOR? The Jewish Studies major helps to develop useful career skills. Students learn how to read critically, to communicate clearly, and to write effectively. By training students to understand different societies and cultures and the interactions among various religious and ethnic groups, the major prepares students to meet the demanding standards of admissions committees and potential employers who are looking for people capable of addressing the needs of an increasingly global and multicultural society. Graduates of our program have gone on to careers in medicine, law, publishing, finance, international relations, politics, the rabbinate, social work, education, and many other professions. 3. WHAT ARE THE REQUIREMENTS OF THE JEWISH STUDIES MAJOR? The Jewish Studies major is structured to provide students with a broad knowledge of Jewish history, literature, language, religion, and culture. The major integrates these different dimensions of Jewish experience and includes the range of disciplinary perspectives that constitute the field of Jewish Studies. Specific requirements of the major are detailed below, but it is important to understand the rich array of courses offered by the Jewish Studies Program. Students may study traditional Jewish texts, such as Bible, Midrash, and Talmud, in courses taught both in the original language and in translation. They have the opportunity to explore the full gamut of Jewish history – from ancient Israel to the Golden Age of Spain, from Eastern Europe to Western Europe, from the United States to modern Israel. Our faculty teach courses in Jewish literature written in many languages – Hebrew, Yiddish, English, German, and even Ladino – offered both in the original language and in translation. Students also have the chance to study Jewish culture in all its varieties, from Jewish mysticism to Jewish humor, from Jewish thought to Holocaust memory, from Jewish languages to Jewish films, produced in Israel, Europe, and the United States. Jewish Studies majors are required to complete three courses in three discrete categories: History, Literature, and Religion & Culture, along with one elective. Because our faculty members expect students to become familiar with the chronological as well as disciplinary breadth of the Jewish experience, the major requires that students fulfill the history requirement by taking courses in at least two of the following three different historical periods: ancient, medieval/early modern, and modern. Normally, majors will do this by completing at least two of the three History of Jewish Civilization surveys, a regularly offered series of courses, each treating a different epoch in Jewish history. Likewise, within the Jewish literature rubric, we require students to take at least one course from the biblical period, one from the rabbinic or medieval periods, and one from the modern period. (We define literature broadly; thus, Bible and Talmud courses, for example, constitute Jewish literature.) The Religion & Culture category offers students the chance to study Judaism as a religion in many forms and periods – ancient, medieval, and modern – as well as to explore Jewish cultural expressions in folklore, politics, and society. We have purposely designed the Religion & Culture rubric to be broad and inclusive, allowing students the flexibility to pursue those areas within Jewish Studies that interest them most. We also believe that students completing the Jewish Studies major must master a Jewish language. Therefore, proficiency in Hebrew or Yiddish is required, either by passing a proficiency exam or completing the fourth semester level of Hebrew or Yiddish, or the equivalent, as determined by the relevant language program. Finally, we consider individual research to be crucial for the major. Students must participate in a senior seminar where they complete a substantial research paper. This experience allows students to become experts in a topic that they choose. Majors also have the option of writing an honors thesis, in which case they enroll in a second semester independent study, in addition to the senior research seminar. In sum, we expect that students graduating with a major in Jewish Studies will have a firm grasp of both the chronological and disciplinary breath of the field, will have obtained proficiency in a Jewish language, and will have completed a substantial research project within the field of Jewish Studies. Graduates will know how to think critically and will have developed the skills of effective speaking and writing; thus, they will be prepared to succeed in whatever career they pursue. In addition to the Jewish Studies major, there are also three other ways to concentrate in Jewish Studies within other departments. The Jewish history concentration within the History major focuses upon the historical dimensions of Jewish experience and the evolution of Jewish life in the context of the different cultures in which Jews have lived. The Hebrew/Judaica Concentration in the Department of Near Eastern Languages and Civilizations focuses upon the study of Hebrew language and literature as a window for understanding Jewish culture and its historical experience through the literary analysis of texts and artifacts. The Judaism Concentration in the Religious Studies Department focuses on the study of Judaism within the context of other world religions and offers students the opportunity to explore the construction of Jewish religion in its different cultural settings. Detailed requirements for the Jewish Studies Major and Minor can be found at the links on the left side of this page. [Mark Wischnitzer, Literary Editor, with David. Bergelson and Der Nister; Rachel Wischnitzer-Bernstein, Art Editor]. Milgroym-Rimon. [Berlin: Rimon, c1922-c1924] Gift of Deborah Karp. From the Abraham J. Karp Collection. 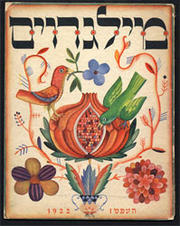 The fabulously illustrated bi-lingual Yiddish-Hebrew periodical is recognized as the first journal of Jewish art. Its art editor, Rachel Wischnitzer, a pioneer in the field of modern Jewish art history, highlights through the vehicle of its covers the way that traditional Jewish motifs could be employed to reinvent medieval Jewish manuscript traditions as a modern magazine of arts and letters.